The word “safari” has its origins in Arabic. It was pronounced “saa-faa-ri” - meaning a long journey, and was adopted during the 19th century into the English language as “safari” by explorers, hunter and missionaries. It is now a widely used term referring to African travel, wether it be by land, water or by foot, as long as the purpose of the safari is to view game, for photographic reasons or for hunting. From a purest’s point of view and African walking safari should take place over a number of days, during a safari party would walk through an African wilderness area, camping a different locations each night. This type of walking safari is possible in certain areas and is a very rewarding safari experience. The itineraries below offer an example of some of our walking safaris available and we can also tailor-make a walking safari to suit your specific interests, budget and requirements. If you love hiking or long walks in nature, but don't enjoy heavy rucksacks & tent camping, then Slack Packing is your game! At African Travel Gateway we discern between four types of walking safaris. The main criteria for a walking safari is that it takes place in an African wilderness area, that naturally supports “plains” and “big” game. Plains game refers to animals that are herbivore and not potentially dangerous to humans. These could include giraffe, impala, kudu wildebeest and the like. Big game refers to animals, that over the centuries have been recognized as potentially dangerous to humans, and include the big 5 (ie: lion, leopard, rhino, buffalo and elephant) but also include animals such as crocodile and hippopotamus. These are the purest form of walking safaris, and can be experienced in the Kruger National Park. They offer trailists a very real and very close encounter with the African wild. Three nights in length, these walking safaris are guided by two well experienced wilderness rangers. Guests carry their own backpacks containing their food, tent, water & clothes and under the guidance of the rangers explore a vast wilderness area with big game. There are no permanent camp sites and no toilet facilities. The trailists set up camp at a different locations each night, and experience the diverseness of wildlife and immense beauty that these wilderness areas offer. 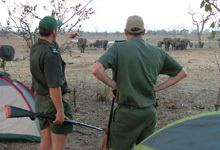 A 2 - 4 day walking safari conducted from a permanent safari camp or lodge. A safari guide would take guests out into the bush for 3 - 4 hour game walks each morning and afternoon, but always returning to the camp or lodge. These are popular in places like the Kruger Park. 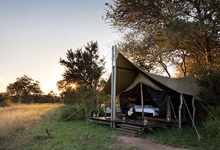 The emphasis is on a wholistic interpretation of the bush including tracks, sights, sounds, smells, birds, insects etc…Over the few days guests become immersed in the day cycles of the wilderness, and can enjoy the comfort of a soft bed and a proper bathing facilities. 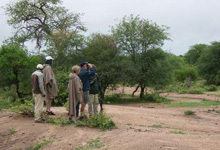 A 2 - 4 day mobile walking safari in which guests walk, under the guidance of a safari guide from camp to camp. These camps can take the form of temporary tented camps set up ahead of guests by a support team, or more permanent camps that remain in place. These are considered to classic walking safari, and carry a certain romantic appeal of a past era, as this is very much how the explorers and hunters of the past used to travel or “safari”. This type of walking safari feels more like a journey as guests are guided through varying habitats and landscapes and always sleep in a different setting. A 2 - 3 hour day walk under the guidance of a safari guide in a big game area with the purpose of viewing game, birds, plants and other signs one can pick up in the bush. These are conducted by nearly all safari lodges and camps in Southern Africa, often as a filler between game drives, or as a main activity in the morning of afternoon. 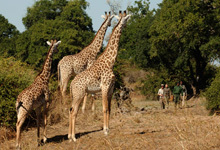 These walks are very much an optional activity where the main safari activities are in fact game drives.